"Modified whey, cocoa (processed with alkali), nonfat milk, maltodextrin, hodrogonated coconut oil, calcium carbonate, less than 2% off: salt, dipotassium phosphate, carrageenan, mono- and diglycerides, acesulfame potassium, sucralose, artificial flavors." Did you know manyof those ingredients are things nutritionists say we should avoid? Which leads me to reason #2 from-scratch cocoa mix is better: The ingredients are simple and clean. 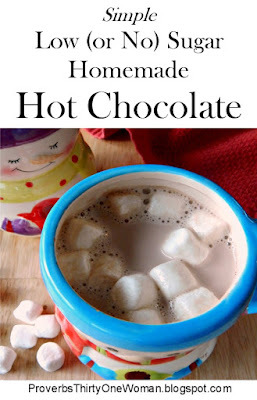 The third reason I love from-scratch hot chocolate is that it's more frugal. I'm always looking for ways to save money on our grocery bill! And the fourth reason is that homemade hot cocoa is really just as quick to whip up as store-bought mixes. This new recipe suits both me and my kids. It has fewer ingredients and is lower in carbs and calories, too! *For my children, I use cane sugar because it is GMO-free. For myself, I add monk fruit (this is exactly what I use), which is a natural sweetener that doesn't spike blood sugar. You could use any sweetener you like, of course, though I do not recommend artificial sweeteners, which are of questionable health. 1. Place the cocoa powder in a mug and add the water. 2. Stir in the heavy cream. Add sweetener, to taste. I use a scant 1 tablespoon of sugar for my kids, and 2 - 3 drops of monk fruit for myself. HINT: Want a more intense chocolate flavor? Add 1/8 teaspoon of instant coffee granules to your cocoa! If desired, top with healthy marshmallows or homemade whipping cream. I have yet to see any pre-made whipped cream that's healthy. Instead, pour a little heavy cream in the bowl of an electric mixer and whip it until peaks stand up in the cream when you remove the beater. Add sweetener to taste. For those who eat sugar, these organic marshmallows are a healthier option. Better yet, make your own without sugar at all. Approximate nutrition without whipping cream or marshmallows, according to LoseIt. (Depending upon products used, your version may vary.) Without Sugar: Calories: 210; Fat: 20.5 g; Protein: 1g. ; Carbs: 3 g. With 1 tablespoon sugar: Calories: 225; Fat: 20.5 g; Protein: 1 g.; Carbs: 7 g.